The NSW Cancer Plan will focus on Aboriginal and multicultural communities, specific cancers and key healthcare systems. Although the burden of cancer is shared by all, the distribution of its impact is not equal. 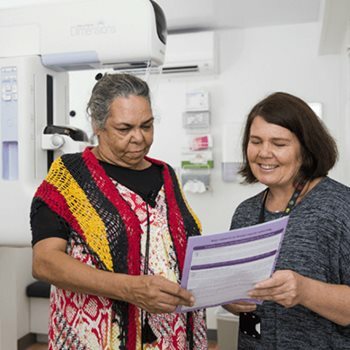 The NSW Cancer Plan improves cancer outcomes across NSW, but also recognises that there are certain people, cancer types and health care systems that require increased or tailored strategies to improve outcomes. Specific actions have been developed and implemented to reduce the impact cancers have on these communities. Aboriginal peoples currently experience a disproportionate burden of disease and poorer cancer outcomes than non-Aboriginal peoples. People from multicultural communities also experience a disproportionate burden of disease to the broader population of NSW. These cancers have a considerable impact on the community, and increasing awareness, ensuring earlier assessment and improving treatment pathways will make a substantial difference to cancer outcomes. The primary health care system, primarily through general practice, is the first point of contact with the health system. It works with the hospitals and specialists where health practitioners diagnose, treat and care for people affected by cancer. These health care providers and the community sector all care for people affected by cancer in NSW. Patient-centred quality cancer health care is the service delivery system in which health practitioners diagnose, treat and care for people affected by cancer. In addition to improving all cancer outcomes across the community, the NSW Cancer Plan will focus specifically on Aboriginal communities. In addition to improving all cancer outcomes across the community, the NSW Cancer Plan will specifically focus on culturally and linguistically diverse (CALD) communities. In addition to improving all cancer outcomes across the community, the NSW Cancer Plan will focus on lung cancers. In addition to improving all cancer outcomes across the community, the NSW Cancer Plan will specifically focus on bowel cancer. In addition to improving all cancer outcomes across the community, the NSW Cancer Plan will focus on primary liver cancers. Key health systems that underpin the cancer journey, including the primary health care system are a focus of the NSW Cancer Plan. The NSW Cancer Plan will focus on key health systems that underpin the cancer journey, including the patient-centred quality cancer health care system.